One of the exciting things we’ve been working on this year is a collaboration with the International School of Colour and Design (ISCD) with each of the students in the Surface Design course coming up with a potential new design for our rolled beeswax pillars. The first batch of designs are in. We’re spoiled for choice and we need your feedback. We’re potentially launching 2 new designs… depending on your feedback. The first design we’ll be launching was chosen by a judging panel consisting of Louise Olsen (Dinosaur Designs), Deb Bibby (editor of Real Living magazine), Jodie Warters (Surface Design teacher, ISCD) and me. The winner will be announced (and profiled) in the Christmas issue of Real Living magazine (on sale on 11th November). Our potential second design will depend on your feedback. For me, there was at least one other design crying out to be part of the Queen B range. But ultimately the success of any new product is completely dependent upon having customers that love it. Please be opinionated, it will only take a second – you can comment below or comment on our Facebook page. I’ll be picking one entry to win a prize pack valued at over $350 (that’s 1 in every size of the new design & a pack of Jam Jar Tealights because they’re gorgeous). The winning comment will be picked on Sunday, 3rd November @ 5pm and my decision is final! Vote loud. Vote long. Vote strong. Here’s your chance to shake off the shackles of your day to day life and be a product designer for a minute… and you’ll have my heartfelt gratitude too. Here’s the line up (and following is a closer up photograph of each design). A very big thank you also to Louise Olsen, Deb Bibby and Jodie Warters for being on the ‘pro’s’ judging panel and sharing their time and expertise. It was a privilege. And it heralded a whole rethink about Queen B and what we do. Thanks for being part of this journey with me. There is no Queen B without our customers. It is you who ultimately keep our dream alive with the choices you make. definitely Pollen and fez lantern! Sunburst definitely. Love the Art Deco look and also reminds me of stained glass. I think the candle slowly burning behind the design will look spectacular. I believe that it will look equally at home in either a formal setting or a casual setting as well. What a high standard these designs are. I found it hard to choose my favourites. In the right setting and for the right person, they would all be lovely. I have finally settled on Bedelia and Sunburst. I think that the ‘Stary Night’ candle is beautifully designed and can be placed in any type of setting, the colour is great and makes it stand out from the other designs! Number one is definitely ‘Pollen’. It’s not an overwhelming pattern, and with the colour it just brightens everything. Second on the list is ‘Bedelia’. It’s a more elegant design, but casually so (does that make sense?). Fez lantern without a doubt! The beautiful shadowy design would fit in perfectly with, and further enhance the ambience and mood that candle light creates. The shimmer of this pattern, with the soft glow of candle light, would set the mood and be absolutely gorgeous for any occasion. Starry night is my pick. The design is relevant to the product, being a star and also reminiscent of a flame glow. The blue is very in this season and it will also stand out beautifully in the daylight when not lit. 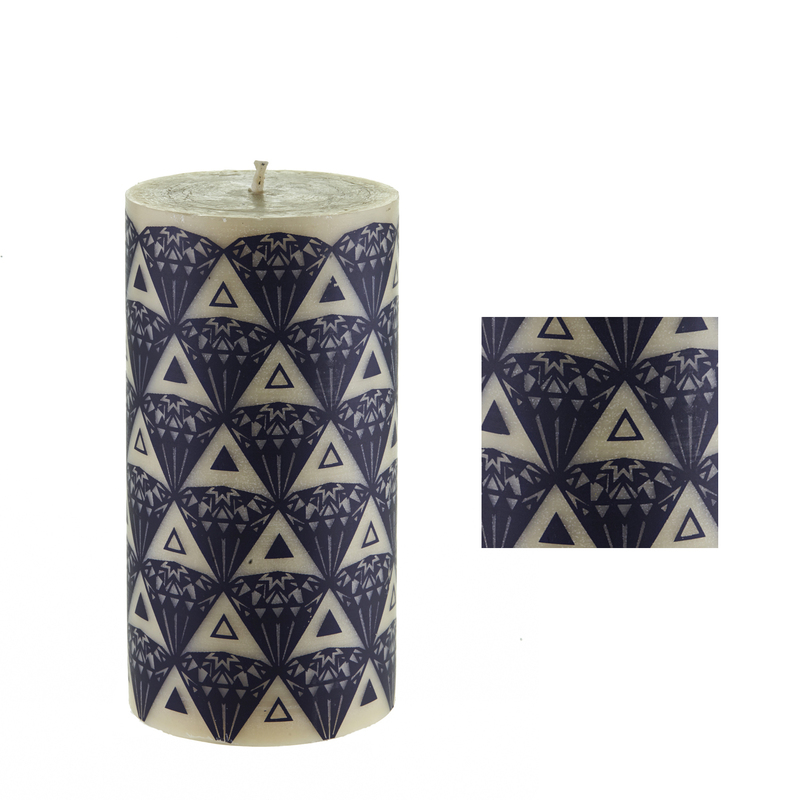 This time of the year is perfect for launching this bright and happy candle. I can see you making the Pollen one too – it’s cute and happy! Definitely vote for Sunburst – its geometric Deco patterns are clean and have great impact – it would look stunning lit and glowing from within – just like a Tiffany / leadlight lampshade. They are all great! I think you need the whole line up actually But my absolute favourite is Sunburst, followed by Angel Wings. Why Sunburst, it’s a subtle art deco look, and deco is so right now. It’s sophisticated and structured and it’s almost like a series of windows. Intriguing to think where/what the windows might look onto. When lit I imagine it will look stunning. Angel Wings has a more etheral look, which is nice and appeals to me. In terms of broader market appeal I wonder if it might be a bit too etheral for most. I like the softer less structured look and the lighter shade as it’s subtle. I love fez lantern. It would look lovely burning in a semi dark room. Very elegant. Starry night first popped out at me……it is a really eye catching, fun and relaxed design which would be fantastic for all the warm summery nights ahead. But then on closer inspection the Fez Lantern does it for me. It actually really does look like one of the glass lanterns that you can buy for using with tealight candles but with the ambience and romance of an actual candle. I think I’m not really keen on the others as they are really busy looking and would be difficult to match with décor I feel. If I needed to pick a third it would be Pollen, also a nice, relaxed summery feel. My vote is for #3, reminds me of stained glass windows I saw in Europe earlier this year. My picks are Fez Lantern and Tribe. To be honest, I think Pollen better fits ‘you’ but I think you’ve picked the wrong colour, something more neutral to compliment more decors and I think you’d be onto a winner. My favourites are definitely Sunburst & Bedelia. Both are such beautiful candles. Sunburst has that beautiful art deco feel but I think the design would appeal to many people and look good in many different spaces. Bedelia is more intricate but I can’t stop looking at it! I love that you see something different every time you look at the pattern. Tribe interests me most. Would look great when alight. For me, the choice has to be Sunburst. 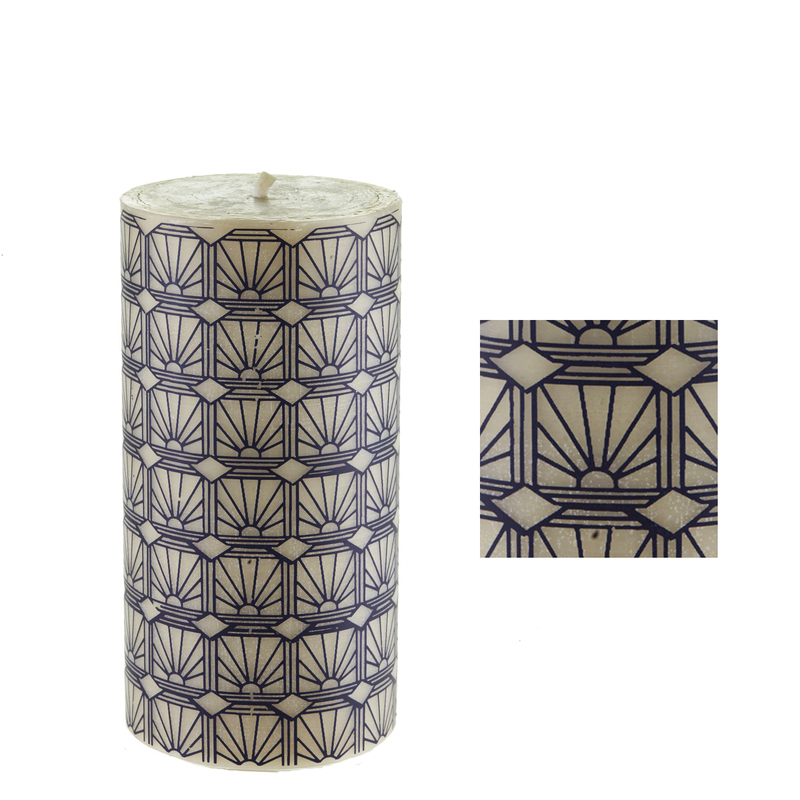 It’s just such a classic geometric art deco pattern that will look great and bring a touch of class to any decor. 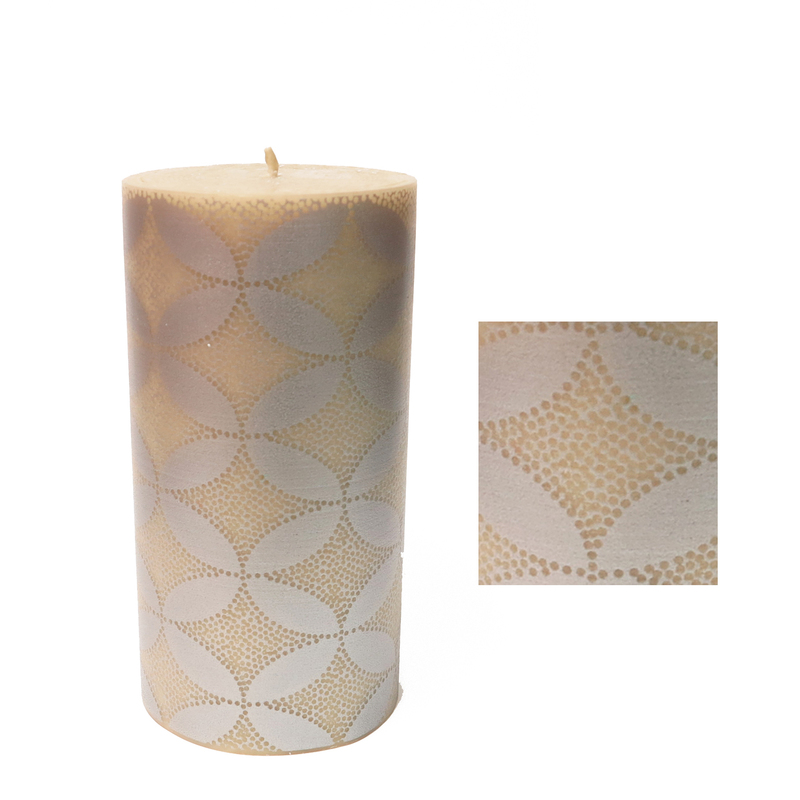 Plus, seeing the glow behind that pattern will be just beautiful – the epitome of candle art! My vote is Sunburst #3. It has the appropriate style and design for the shape and object. Very clever. Well done it makes the object come alive and be part of the expression of what it is as well as making the object suitable for any application and ambience. First place I think ‘Fez Lantern’ and second ‘Pollen’. I think both if them will work with a lot of decors at the moment and will easily suit being made into a series of different colours. Absolutely ‘Pollen’ the yellow hexagons! It screams happiness and light and keeps the eye engaged and heightens the pillar. 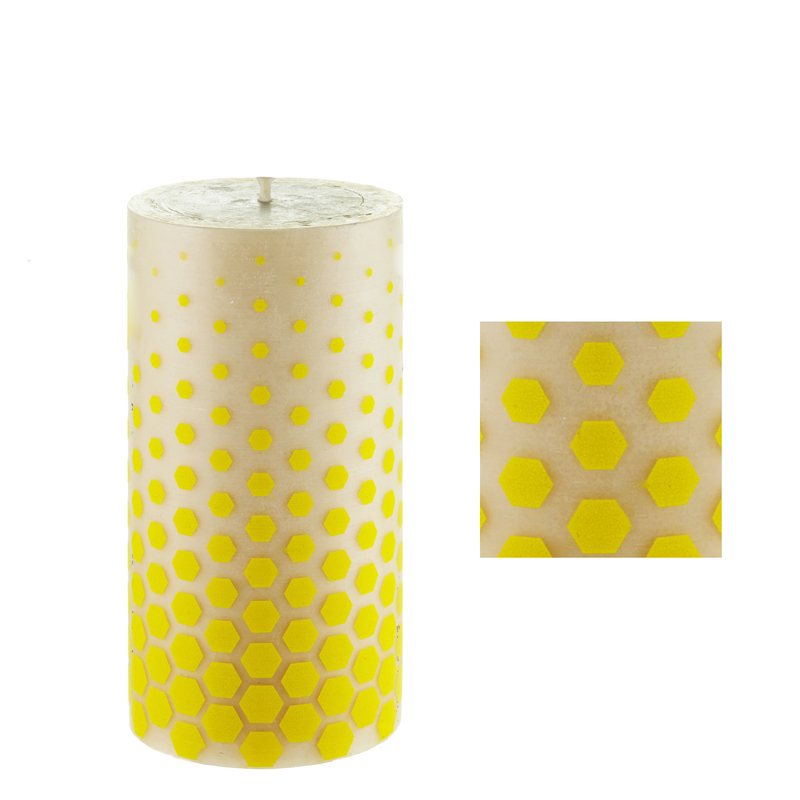 It also really reminds you that these are beeswax candles, the design reminiscent of honeycomb which means treats and natural food, sweetness and sunshine – conditions for the bees to do their ‘thang’ in! I believe the black designs are all too ‘heavy’ on the eye, the blue design, ‘Starry nights’ is intriguing – it just doesn’t seem the right colour to complement beeswax to me. If that once could be done in a gradation of yellow, orange and red it would be startling and tempting to me regardless of the scent! They are all really lovely and impressive but the one that I would choose is “Bedelia”. I like this one the most as no matter how low your candle burns the pattern is still there and stays the same as it covers the entire candle. I love ‘Pollen’ the colours are uplifting and just perfect for our sunny climate. 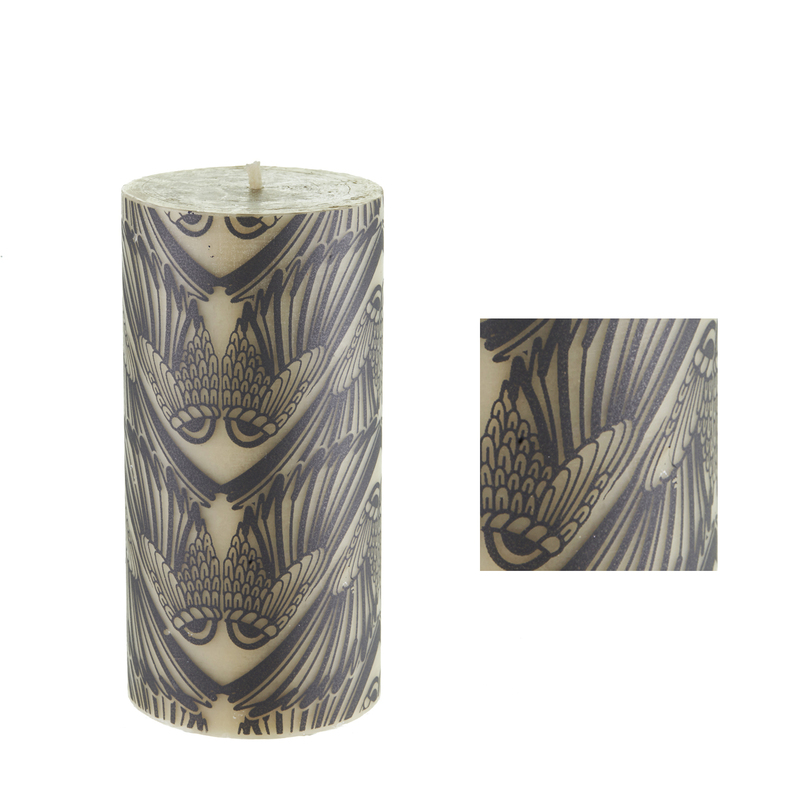 Its definitely a ‘happy’ candle and suits Queen B to a t as obviously its name is associated with bees….. Tribe because it clearly stands out as the best design when placed together with all the others! They are all lovely, but for me Tribe is the best. I think it is right on trend with current decorator styles and would look lovely burning. I would like to pick more than one but Pollen. I love the splash of bright yellow, this wold look spectacular in my home. Pollen is as sweet as honey! Love the natural colour choice and link to where the product is sourced. Tribe for me 🙂 But they are all lovely! It will have to be “Fez Lantern” for me. “Starry Night” appeals to me by far. As soon as I saw it, I said, “this is the one.” Most of the other designs are too heavy, overpowering – intimidating, even – and depressingly dark. “SN” is bright, cheerful and not over-stated. It has to be the winner! These are all amazing and clever designs but for me Tribe stood out above the rest. I love the use of colour and the design is ingenious and eye catching. It will look amazing as it burns! I’m torn. They are all so amazing, but if I really, really have to choose one, it would be Bedelia. Definitely Pollen, it is the only design which will look better when alight and will continue to look good as it burns down particularly as the colour matches the flame. Sunburst is my favourite. The patterning just suits the vessel. It would look stunning in the soft glow of candlelight. While I enjoyed looking at all the candles, for me, Tribe stood out a mile. It has a particularly strong, ethnic look which is reflected in its name and I loved the symmetry of the design. I also like the idea that as the candle burns, the balance of the design will alter the look of the candle. I would love this in my sitting room. I love Fez lantern- it’s subtle, soft, love the colour, starry pattern, has a calming soothing effect and perfect for the Christmas or any season. Ultimately it would suit my apartment decor and I’d buy a few. Perfect for weddings and christening a too. Bedelia is my second favourite. I love the pattern!! Pollen. 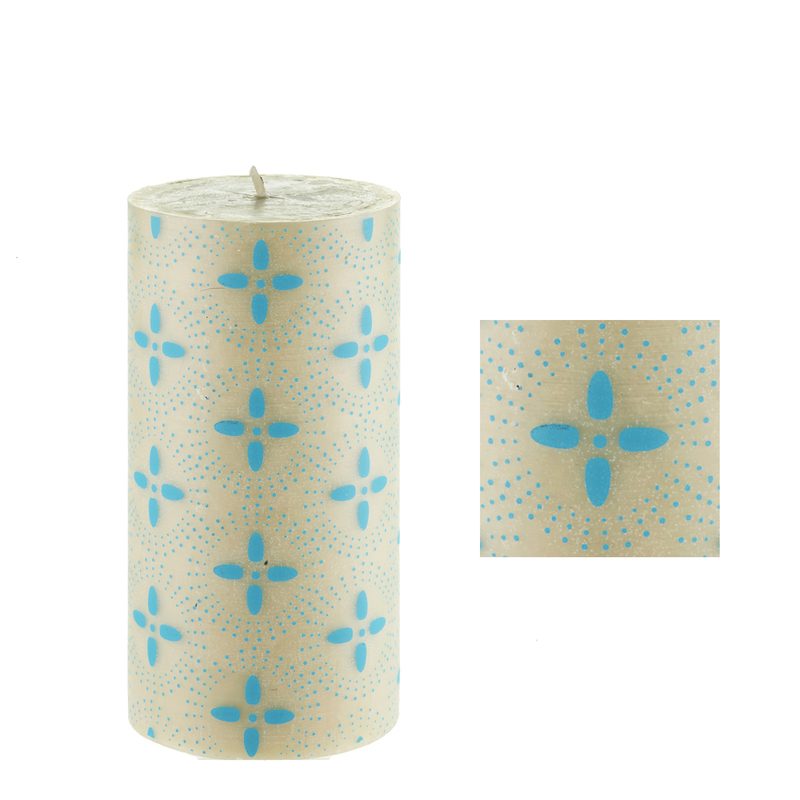 A happy, bright colour and a simple design to complement the goodness of pure beewax. I like the one Cate likes best. LOL… I think that may be called trying to bribe the judge but thanks for the laugh. I’ll send you a pack of Bee Lights just for being a riot. Pollen – yellow is very summery and makes everyone smile! I like Fez Lantern the best. I love lighting your candles at night time. I have some jam jars sitting on my kitchen bench while I cook, the tapers on the dining room table for dinner and tea lights on our bedside tables. There is something special about lighting a beeswax candle, it instantly makes me feel better and always puts a smile on my face. Thank you for making such a lovely product. I am delighted to tell you that you are the winner of the prize pack. The winning design will be announced on 11th November when the December issue of Real Living Magazine goes on sale with the judges pick. Thank you for taking the time to vote, for your lovely comments and for loving both our work and the extraordinary work of the tens of millions of bees that contribute to our candles. If you can pop me an email with your address, we’ll get your prize pack off to you as soon as the winning design is announced. Wow! Many lovely designs here! My favourite however is Fez Lantern as it is calming and timeless. It would also suit any décor. I also love Bedelia. I think that I would used either of these without tiring of the design. No 1 is Pollen for me – Love the yellow retro colour and feel, combined with happy sunshine, bees and and the geometric honeycomb shapes. It has to bee “Pollen” for sure. A lovely ode to the hard working hive that thrive on the yellow stuff. And even better is that it’s safe for anyone with hayfever. at first I thought to pick one of the more colourful designs. but the more I looked the more I was drawn to sunburst. The pattern looks almost like crochet lace or something similar and the geometry of the squares and diamonds with the sun motif is really effective. Plus it makes me think of the little bit of ‘sunshine’ your candles give us all. Fez Lantern is my pick. I love the simple design and neutral colour tone, which I feel compliments the candles beautifully. This would definitely be the design I would buy. Sunburst is my favourite. It was the first one to catch my eye. Natural threads would be my second choice. Sunburst struck me from the very beginning. Up close, the design is precise, delicate and versatile. It will coordinate well with many different looks and eras, from Deco and the Nordic trends of today to the more casual and eclectic styles. From a distance, the pattern is clear, yet subtle – ensuring it is a feature of the room without being obtrusive. It could easily enliven and enlighten any room in the house – inside or out! 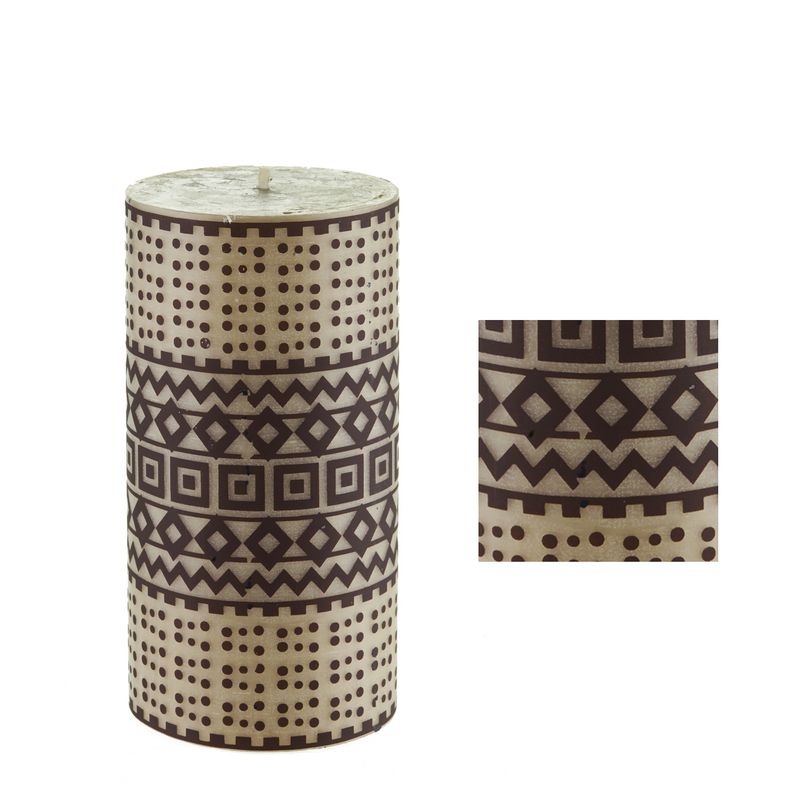 I’ve found in my experience of burning candles, usually in darker times and places, that the black and white patterns stand out more than lighter colours and are hence, more striking. The Art-Deco pattern, which is not only on trend but timeless, is also reminiscent of stained glass windows. Imagine the light shining through these as the flame burns lower! (Look now and imagine – go on!) For me, candles are for burning – and it is the Sunburst which I feel would be the most mesmerising. I just love your plain rolled candles to bits. To me they say it all and celebrate nature’s beauty in beautiful simplicity. But as a designer i appreciate the need for patterns too! My vote goes to Fez Lantern. It has an ethereal quality, would be suitable for almost any occasion and look wonderful in almost any setting. Very difficult to choose just one so will go with first impressions. Fez lantern, modern, elegant, would suit any mood or occasion. I think Starry Night is the best. It stands out from the crowd (or the decor). The colour pops yet goes great with muted colours. While I love the darker coloured designs for their delicate intricate patterns, the lighter coloured designs really stand out and to my mind have more universal appeal. I love Starry Night, perfect for Christmas under Australian skies, but Fez Lantern would have to be my first choice, as it looks very elegant and timeless and seems to glimmer a bit. I think it would look very special lit up and suit many occasions. Pollen is very quirky and I think a splash of yellow can look really lovely in most homes, even if yellow isn’t your cup of tea colour-wise. I think these three are more contemporary and modern so would choose them over the other ones. #6 Angel Wings definitely! Before I read the name, I loved the wing design as I thought that they were bee’s wings. It would be a wonderful tribute to these hardworking creatures who provide such a beautiful soft light for us all to enjoy. Angels looking down from above would make it extra special too! Bedelia. Reminds me of fat little bee bottoms sticking out of flowers whilst they collect pollen. I love it. For me, Pollen comes out a winner, closely followed by Fez Lantern, I prefer the lighter colours in the design. Off to light one of your candles! Pollen – a new design from the Queen B range that celebrates glorious pollen is a celebration in itself. The hexagons are like pollen baskets gradually getting bigger as the busy bees move from flower to flower … and in yellow, the happy colour, lovely in daylight and beautifully enhanced at night by a glowing wick. Congratulations to the design students – a wonderfully varied response to the brief which just goes to show how inspiring beeswax is. Definitely Bedelia for me – complex and elegant, it reminds me of ‘broekie lace’ (the lacy edge of ladies underwear) – the ornate iron work found on the verandahs and stoeps of old Victorian homes in South Africa. So i have to pick the first one that grabbed my eye, and that’s the “pollen” design. You already have so many beautiful classic designs but the pollen one is bright and happy. Plus, it’s a tribute to the amazing little creatures that make the gorgeous beewax that form your candles. Long live the bees! Thankyou for allowing us to be a part of your decisions. what a shame I can only suggest one………tossing up between Fez and Sunburst……I think I’ll choose Sunburst, great art deco style would go with my 40’s house and furniture…and scale of design better on the candle than Fez! My choice from the designs shown is Pollen. However I confess that I prefer the plain uncoloured beeswax. Ooh, what a delightful challenge. All are gorgeous. To choose only one, however, means I’ll have to ignore the picture in my head of the eager (and talented) students who created the designs whose entire future careers might depend on this one opportunity. No pressure. OK… 5 is my favourite number, yellow is happy but the design reminds me of the pattern on those IKEA zip lock bags (sorry). 7 is perhaps a little too subtle. Generally all the others but one are reminiscent of other patterns and colours in the Queen B range, which is not a bad thing, but you are seeking a new design after all, so it should stand out from the rest I reckon. So… ta da… 2 it is! Why? This is Sydney, there’s water everywhere so we need blue, don’t you think? The design’s bright, open and positive, not too busy (unlike Sydney on that front), will suit boys and girls and the name ‘Starry Night’ reminds me of the Earth Hour collaboration. Bedella closely followed by tribe. Love the organic feel of them both. Pollen for me – classy, appropriate, and the bottom-heavy colour saturation will look gorgeous standing on something reflective or with a bit of shine. Natural Threads would be my runner up – the handmade look is very in! and a border pattern always adds decorum – because while Bedelia is a stunning pattern close up, it seems to get a bit lost at a distance. But isn’t it amazing how different we all are – Starry Night and Fez Lantern are my least favourites although so far the numbers seem to be with them. I don’t envy you the decision, Cate – although I could easily be persuaded to take the losers off your hands! Fez Lantern. Definitely has the advantage of being very unique and feeeels so lovely. Bees & POLLEN go together & the Queen bee brings unity to the colony. Soooo it has to be POLLEN ! Pollen is my favourite. It reminds so much of the beautiful hardworking bees that bring us such gorgeous candles. The hexagon shape is their signature and suggests strength, courage, beauty and the perfect natural symbol. I love it!! I love Bedelia. I soon as I saw it, it reminded me of the symbol for the”seed of life” or sometimes known as the “flower of life”. It is like a visual expression of the connection of life that runs through all beings. I love it!!!!! Def pollen, think the name and design are just so……Queen ‘B’ ish , but also the graduated colour resembles a flame. I love Pollen! So happy, and so appropriate for a beautiful beeswax candle! I love them all, so hard to choose one, but I choose Bedelia – so striking with intricate detail it looks very special as it is – and I can imagine it would be more beautiful alight in any room at my place. Just lovely (and very special like all of your quality candles are). I would incorporate all the designs. 1. Best seller: Fez lantern for every day, weddings, engagements and christenings. 2. For Spring and Summer: Pollen and Starry Night. 3. Exotic evenings for all Seasons: Natural Threads, Tribe and Sunburst. 4. Modern Decor: Angel Wings and Bedelia. 5. Engagement Party: Diamonds are a girl’s best friend. Number eight I appreciate! She looks good from a distance and close up. Almost plain from afar but when you look closer you see lots of little flames. Plus the colour would go with pretty much any colour scheme. Three cheers for Bedelia. Bedelia is stunning in its simplicity and elegance and a perfect complement to your existing range. A profusion of thoughts: Bursting seed pods, lace stockings, filigree silver and even Charles Rennie (Mackintosh). Bedelia would be at home anywhere. I dearly hope you choose it for your collection. Talk about being spoilt for choice! Looks like Fez is a hit but I LOVE Tribe. Beeswax is such a natural earthy product I feel it needs an earthy design to accompany it. I do love Fez and all the natural coloured designs, but feel the bright colours seem vulgar against such a natural pure miraculous medium. As many cheaper parrafin candles feature bright colours, leave that to the general populous. Whatever the final choice, respect the medium and it is sure to be a winner. My first preference is ‘Tribe’. It is strong – and powerfully strong at its core – in parallel with Queen B. 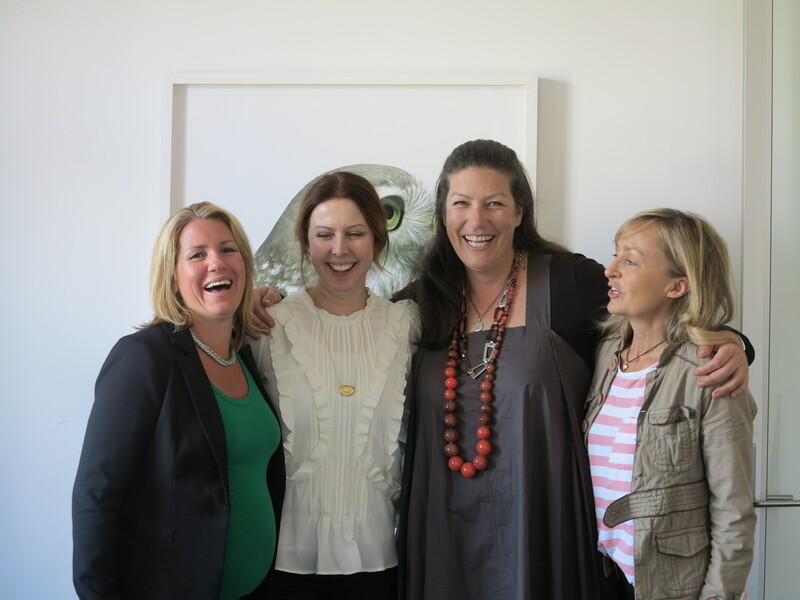 Your commitment to provide an ethical, sustainable and beautiful product is underpinned by your strength, Cate. Your ethical choices are evident and the product is outstanding! My second choice is ‘Starry Night’. Light and bright. Perfect at Christmas and any time of the day or night! Sunburst is my favourite , contemporary and outstanding . Definitely a winner! Well done to all the students, they are all great designs and I would be happy to see all of them on candles at my place. I really like Pollen because the idea fits really well with the beeswax. But when I think about how they will look with a flame burning behind them, I think the Diamonds will look pretty good, but a little too solid for me. I feel that Sunburst will be lovely with a flame behind it, but it is a close second to my absolute favourite, Bedelia. I choose Fez Lantern. 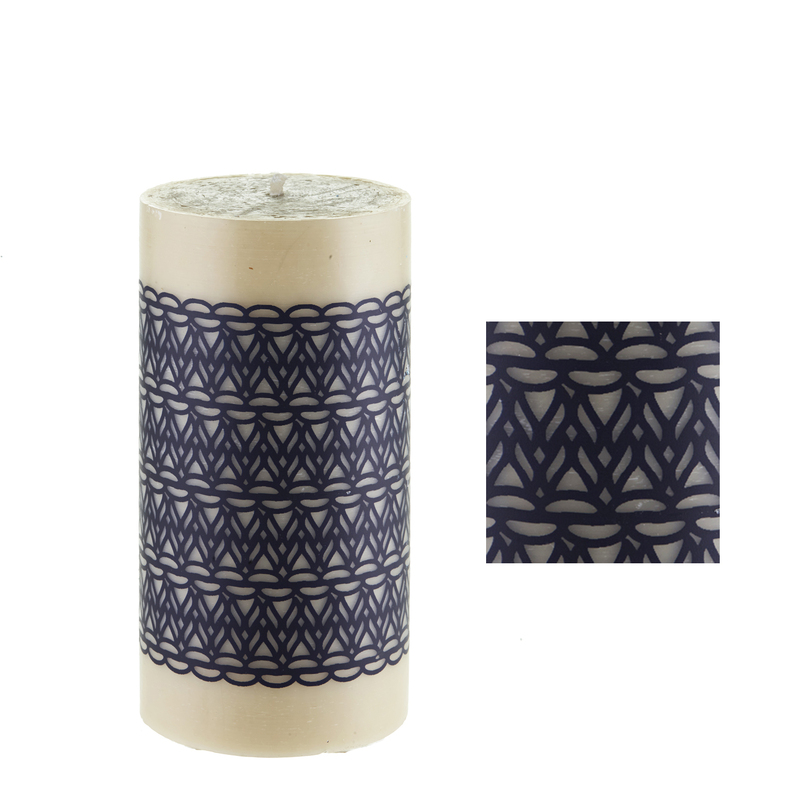 I love the soft pretty pattern design and it is very different from the other hand rolled candles you sell. A set of these on display would look beautiful. Oh Cate! They’re All wonderful! I’ve been looking back (drooling) at the photos the last two days. Tribe has a rustic character to it. Which would suit the other treasures within my home. Pollen is so clever. So, so, SO Clever! Almost, obvious, yet a really wonderful surprise. But perhaps Bedelia. This would be the design I would choose as a Gift of all offered above. It has a natural, flowing elegance about it. Thank you for including us! Definitely Fez Lantern!! Very subtle and will be beautiful as the wick burns down. Sunburst compliments your current look and feel and available range beautifully, but there was one that really won both my heart and mind: Pollen. My heart for Pollen – it gives me visions of Spring fields, of laughter, and twinkling smiling eyes. It feels fresh, and very “now” in its design. If feel like candles are not just for cold winter nights any more, Pollen is here to light up my balmy Summer evenings too. My head for Pollen: it complements your currently available designs, whilst extending to a new and fresh dimension. It reaches different people because of it’s unique edge. It’s bright and breezy, and will look amazing in rooms both day and night. Fez Lantern is beautiful.. This design would go in any setting and is lovely and subtle. For me there is one that stands out which is the Pollen. I absolutely love the look of it. It is the only design with a slight different approach, the graduation of the shape is beautiful and leads the eye to the flame. Yellow is the perfect colour as it is bright and so alive! The decor connects to the beeswax, in a strong decorative way. It is a design of today with a colour that bursts happiness and summer! It is beautiful as a candle, but as a object of decoration as well. I’m not into candles that much, but no doubt I would happily make an exception for the Pollen! Pollen does it for me. Candles are usually for mood lighting and the yellow flame and yellow pollen would give a soft warm light. Many of the other designs are heavy or very intricate and while the patterns are beautiful I’m not so sure they wouldn’t fight the mood you would be trying to create by using candles. Simple is best. Fez Lantern is my second choice, for formal occasions. My vote must go for Pollen. The designs are all beautiful, but this one says so much with such simplicity. The yellow is the perfect shade – happy and bright – it will look brilliant when lit – and the design is pared back and modern, but also reflects the geometric design of the honeycomb perfectly. 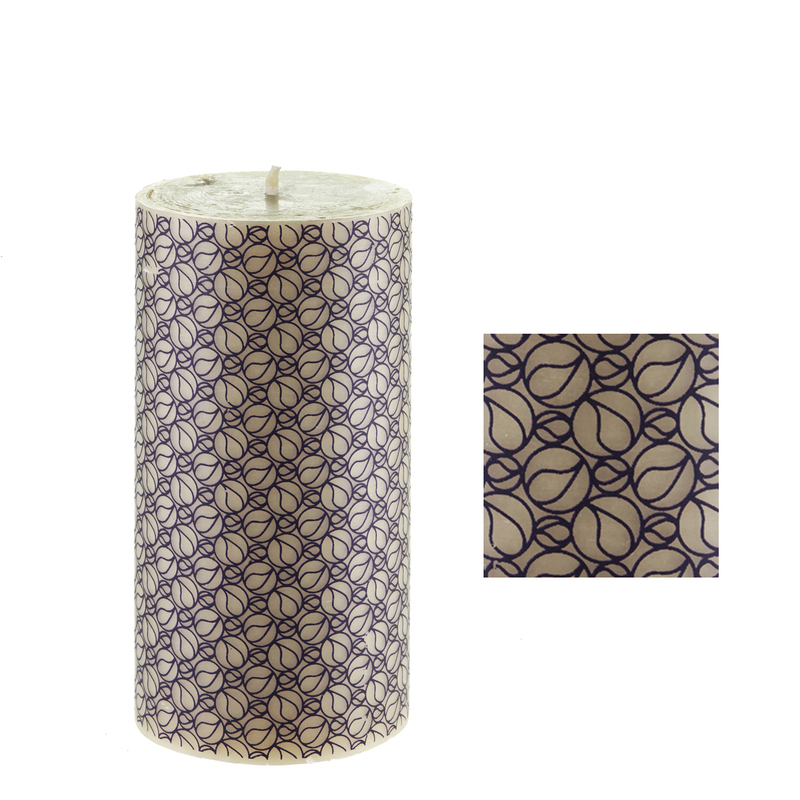 What more could you want from as designer beeswax candle? My favourite is Natural Threads. The design looks gorgeous at a distance as well as close up. You can’t go wrong with indigo blue. Pollen gets my vote, what a gorgeous idea! and so effective, it will also give lovely warmth in colour when you burn it. My fave is Pollen! great colour, very on trend! well done to all, each design is beautiful! As a thank you to everyone who has taken the time to comment/vote on our new design (whether on the blog, on Facebook, on Instagram or via email), we’ll be giving you a limited opportunity to buy the new design at 20% off as soon as it is announced and launched. The offer only applies to comments made on or prior to 4th November. More details to follows. Thanks for being engaged in what we do and thank you giving us your valuable and valued feedback. The million dollar question - what paint do we use to decorate our rolled pillars? A bee garden for Sydney?